With beetles there are multiple species that we deal with, and they eat everything from wood to carpet and crackers to clothes. It’s the larval stage with most beetles that do the most damage. Because of all of the different places they could be we would need to do a proper inspection so that we can make the proper identification. 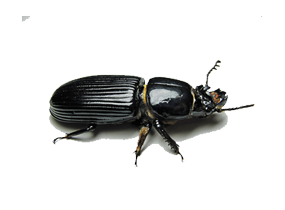 The most damaging wood destroying beetle is the Powderpost beetle. The Powerpost beetle is a small (1/8-3/4 inches long), wood-boring insect which reduces wood to a fine, flour-like powder. Damage is done by the larvae as they create narrow, meandering tunnels in wood as they feed. 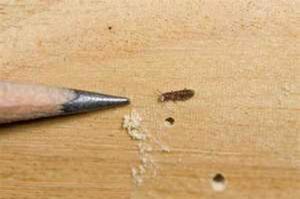 Infestations are often discovered after noticing small, round “shotholes” in the wood surface. These are exit holes where adult beetles have chewed out of the wood after completing their development.Newly-emerged adults mate and lay eggs on or below the surface of bare (unfinished) wood. The eggs hatch into tiny larvae which bore into the wood, emerging as adults 1-5 years later. Always store firewood away from your house, since beetles often infest firewood.